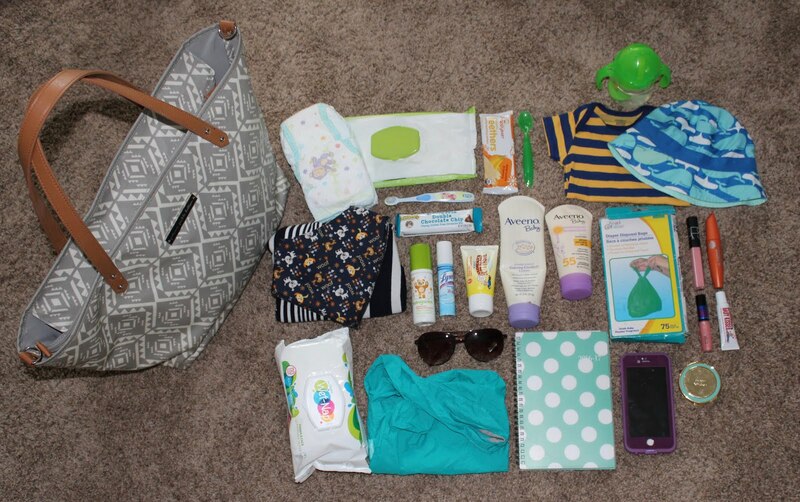 Today, I thought I would give you all a little peak into my diaper bag and what I carry around on a day to day basis for Lincoln. As a first time mom, I know that I like to see what other mamas are doing to get some ideas for myself. Unfortunately, babies don't come with instruction manuals... so I love getting advice and tips from other moms. I remember the days when I used to leave the house with my little crossbody purse that contained my wallet, phone, chapstick, and keys. Ahhhh... those were the days. Well, a lot has changed since then. Now, I have to lug around a tote full of all kinds of fun things to keep my little guy happy and taken care of! So, here is everything I like to bring with me on a typical day! 1. Diapers and wipes - Obviously. You don't want to leave the house without these! 2. Snacks for Lincoln - I have some teething crackers and a spoon. I will also throw a jar of baby food in there if we will be out for awhile. 3. Change of clothes - Accidents happen. 4. Hat - We do live in sunny San Diego! If you follow me on Instagram, you probably see Lincoln wearing this hat in a lot of my pictures. Now you know why! It is the one I keep in my diaper bag. 5. Sippy cup - Lincoln loves water! And it has been HOT lately. 6. Nursing cover - We are still nursing every 3-4 hours in between meals. I HIGHLY recommend the Covered Goods nursing cover for all the breastfeeding moms out there! It is super soft, lightweight, and provides 360 coverage. Now that he is bigger, I just use it as a nursing scarf instead of a full cover. I love this thing! 7. Bib - For drool, mainly. Lincoln is currently cutting his top two teeth. My friend made me a few bibs in different patterns, and this is one of the ones she gave me! Adorable right?! 8. Lysol and hand sanitizer - Who wants a sick baby? Not me. 9. Diaper rash cream - In my opinion, this brand works wayyyy better than Desitin. 10. Snack for me - I don't like being hungry. 11. Lincoln's toothbrush - See previous post. Lincoln likes to carry this thing around 24/7. 12. Lotion and sunscreen - I like the Aveeno brand. 13. Diaper disposal bags - I use these for dirty diapers, soiled clothes, dirty spoons/bottles. They keep the mess contained until I get home. 14. Lipgloss, chapstick, and mascara - They help me look put together in a hurry! 15. Wet wipes - For wiping down dirty surfaces and hands. 17. "Portable" tote bag - I like to keep this in my diaper bag for quick errands. For instance, if I am just running in the mall to make a return or something, I won't bring my whole diaper bag. I will just throw my wallet, a diaper, and wipes in this small bag and head inside. 18. My planner - I would be lost without it. It goes everywhere with me. 19. Phone - With a LifeProof case. 20. Tiny mirror - to check myself. 21. Unpictured items - Wallet (with credit card, ID, etc..) I accidentally left it in the pocket of my bag when I took the picture. And toys, I always throw a few toys in before we leave the house. And thats it! Of course, the items in this bag change all of the time. When Lincoln was a newborn, I would have made sure I had like three extra outfits and 10 pacifiers. And in a few months, hopefully we won't need to be carrying around his toothbrush anymore. But, this is what works for us for now... until things change again. I’m a wife, mama, and blogger who enjoys spending time with my family and sharing things I love! Thanks for stopping by! XO!